There are a number of Planned Activity Groups (PAGs) and support services running in the community throughout the year for people with younger onset dementia and their carers. Browse the selection below to find a group or service in your local area. Service description: Monday, Thursday and Friday social outing and activity groups for people living with a brain injury, dementia, social isolation or are in need of companionship and support. Eligibility Criteria: Adults residing in the South Eastern Region who may benefit from attending a planned social activity group. Service description: Caladenia provides social and activity programs for people living with dementia. Caladenia does not provide a specific group for people under 65 years. We recognise that all people living with dementia have different skills and interests and are at different stages. We chat to people individually and work together to choose the days and activities that best suit them. If we do not provide the type of group or activity you are looking for, we can most certainly let you know about other services and agencies in the Yarra Ranges. Eligibility Criteria: Participants must have a diagnosis of dementia or Mild Cognitive Impairment (MCI). This service is for residents of the Shire of Yarra Ranges and bordering municipalities by agreement. Service Description: Killara House Ringwood is a welcoming and inclusive home-like centre that offers social, recreation, and leisure activities for people living with memory loss challenges. Working with participants to create programs that reflect the interests and preferences of our participants our hours are Monday – Friday 9.30am to 3pm. Programs include bus outings and in-house activities with lunch and refreshments provided. Fees vary according to activity or excursion but are typically between $10 and $20 per day. Over 65 years - Participants who are registered with My Aged Care are eligible for the subsidised rate through Government funding. Under 65 years are HACC eligible. Service description: A Planned Activity Group for people under 65 years with Early Onset Dementia. Activities: This is an Out and About group visiting attractions within the local community and metropolitan areas of Melbourne. Activities will be negotiated with all participants at a bi-monthly meeting. Cost: $12 per session plus entry cost to attractions. Carer Support Group: Carers meeting runs the last Friday of the month for carers to come and socialise with other carers to raise any issues or concerns within a friendly environment. Please contact 03 9430 9125 to attend the Carers Group. Eligibility Criteria: Individuals under 65 years with a diagnosis of Early Onset Dementia, low care. Service description: We aim to provide a program which enables people with younger onset dementia to live a life of value. The focus of the group is to identify what a valued life looks like for each person and support them to achieve that. Our Younger Onset Dementia Group is a weekly Day Program. The group supports people to learn new skills, maintain social connections and participate in meaningful activities. We also offer support for relatives and friends of people with younger onset dementia. We offer the following activities: gardening, sport and recreational activities, community outings, short courses, music, art groups, iPad sessions, reading groups, exercise and fitness classes, as well as information and resources provided about younger onset dementia. We are interested in finding out how a person with younger onset dementia would like their life to be. What are the things they like to do? Our services focus on the person and how each individual wants to live a valued life. Eligibility Criteria: Participants must have a diagnosis of dementia, be 65 years or under and reside within the local Council areas of Frankston, Casey, Kingston and the Mornington Peninsula. Service description: Wednesday Planned Activity Group for younger onset clients. The group has a range of activities including outings, craft and exercises. All activities are based on client choice and interests. Eligibility Criteria: Participants must be 64 years or under and have a diagnosis of a neurological condition that impacts on their lifestyle. Participants must reside within the City of Moreland. Out of area referrals will be accepted, however participants will need to provide their own transport. Service description: A weekly outing group for up to 8 people. Outings to venues of interest to participants including lunch and transport. The program offers respite and support to carers and assistance to access further services as required. Service description: The Eyres House Programs provide opportunities for younger adults with dementia to participate in activities designed to stimulate and sustain personal strengths and to maintain social interaction and community participation. 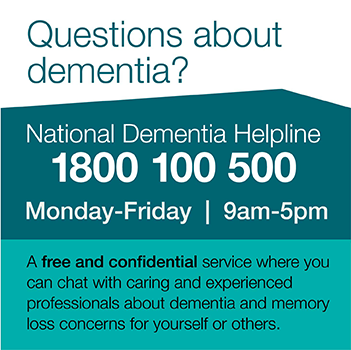 Eligibility Criteria: Participants must have a confirmed diagnosis of dementia. Service description: Younger Onset Dementia Peer Support Group meets bi-monthly at CarerLinks North. This group provides an opportunity for carers to connect with those who share similar experiences and to gain support and strength from each other. At alternate meetings, guest speakers present on a range of topics of interest as identified by carers. Respite can be arranged to assist the carer to attend and assistance with transport may be provided. Eligibility Criteria: Participants must be a carer of a person with younger onset dementia or have a diagnosis of dementia prior to the age of 65. Carer must live in the Moreland, Darebin, Yarra, Banyule Nillumbik, Hume, or Whittlesea Local Government areas. Eligibility Criteria: Participants must have a diagnosis of dementia under the age of 65 and live within the Eastern Metropolitan region. Service description: Car outing every Wednesday from 9:30am - 2:30pm. Exercise program at Strathdon Gym (exercise assessment required prior to starting the program), followed by morning tea, lunch and other activites as mutually decided by the group. Eligibility Criteria: Participants must have a diagnosis of dementia under the age of 65 and be independant with toileting, eating and have no severe behavioural issues. Participants must also reside in the Whitehorse, Manningham or Monash regions (other areas negotiable) and be able to cooperate and function within a small group situation. Service description: Give it a go is a group program of activities for a maximum of 8 participants. Give it a go provides a positive introduction to activity services. The program runs over a period of 12 to 18 months. It acts as a transitional program to encourage participation in other activity services on an ongoing basis. The program runs on Wednesdays from 9am to 3pm. The cost is $5 per day. Occasionally there will are additional costs for special outings or activities. The activities are run by 2 trained staff who are experienced in working with people with dementia.Transport is provided. Contact Details: Give it a go is part of Community Support Options. To discuss the program further, please call Intake on 9792 7579. For general enquiries about Community Support Options please call 9792 7579. Please fax referrals to 8558 9190 or visit www.s2s.org.au.